Essence of Perelandra (EoP) - Perelandra Ltd. When I stopped holding open houses at Perelandra years ago due to the massive carbon footprint each open house added to our planet, one of the things I regretted from that decision was eliminating the opportunity for you to visit the Perelandra garden. Each summer we had over 1,000 visitors from around the world. You see, I've been working with nature for more than thirty years to carefully construct a garden "biosphere" that operated on the principles of full balance. When visitors walked into the Perelandra garden, they experienced the unique level of balance that has been created, and this experience benefitted them in deep ways — physically, emotionally, mentally, and even "soulfully." Well, I'm very pleased to say that with Essence of Perelandra (EoP) that experience is back! And you don't have to leave home to receive its benefits. Around Perelandra we've been calling the EoP "balance in a bottle." It is a carefully constructed, complex electrical pattern that captures all of the elements within each of the levels in the full garden biosphere that interconnect to create the unique balance we call "the Perelandra garden." Use Essence of Perelandra anytime and anywhere you wish to provide a unique foundation of balance, stability, strength and support. The dose: 10 drops. You may take 10 drops of EoP orally to add balance, stability, strength and support for your overall health and well-being. You may give 10 drops to a child or infant for their health and well-being. And you may give 10 drops to a pet. You can also use EoP "non-orally" and provide 10 drops to your job, specific work-related tasks, any project you are working on or any soil-less garden you are working with. You may add EoP to your home, garden or farm biosphere to give it additional balance, stability, strength and support. (See "Directions" for how to apply EoP by clicking on the linked brochure.) Have you noticed I keep saying "10 drops?" That's because no matter how you wish to use Essence of Perelandra, you always use 10 drops per dose. Could this be any easier? A brochure with instructions will be included with each order upon request. Or read it online here. Ideas and inspiration for using EoP to add strength and balance to your daily life. In order to better describe what Essence of Perelandra provides, I let four staff members work with it for twenty days. Then I asked them to write what they experienced, including any changes or results, and how they would describe EoP to you. As our world has become more complex, there is a pressing need to bring the support of deep balance into all the areas of our lives — health, job, projects and goals, and our environment. Essence of Perelandra has been created specifically by Machaelle and nature as a tool for making the deep balance of the Perelandra garden available to anyone who desires a greater support from nature for themselves, their family, their home and their projects. EoP helps us in several ways. It fosters better mental focus and understanding of how elements of a project work together. It forms an environment that allows these elements to flow and coordinate with each other more easily. It facilitates right order and timing as the elements mesh and work toward the goal. It can bring greater intuitive insights and a sense of "getting unstuck" when we are faced with thorny or difficult problems. It does all these things by providing a balanced foundation where things just plain work better because the full support of nature is there. People who have visited the Perelandra garden over the years have often commented on how they feel more clear and energized in its supportive field. Now, Machaelle and nature have found a way to bottle this up and make it more widely available. Essence of Perelandra won't create a miniature Perelandra for you but it will give you an important tool for helping make you and whatever you are doing more efficient and better give you the results you're seeking. How would I describe Essence of Perelandra? Balance in a bottle. But not that "magic-bullet, you-don't-have-to-do-any-work" kind of way. You can be handed everything in the world to function well, but you still have to choose to make use of it. Think of a task that you do on a regular basis — like balancing your checkbook, your commute to work, preparing dinner, cleaning the house, organizing volunteers, writing an email, an Energy Cleansing of your home ... anything. You know how that task normally feels. You know what parts you have difficulty with or find challenging. Now imagine support. Support from the balance of the Perelandra garden given to you, your home, your family, your work, your life. Imagine the kind of quality that comes from a foundation like that. And imagine what kind of impact that can have on the world around you. That's what Essence of Perelandra gives. 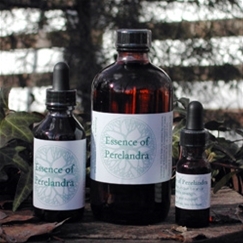 Essence of Perelandra offers "a walk in the garden," and specifically, the Perelandra garden. As Machaelle originally explained it, it gives you the benefits of an afternoon in the Perelandra garden. For me, it seems to be a shift that affects my mind and emotions in a positive way that the Perelandra Essences and ETS do not. When taking it for preparing for a busy work day at Perelandra, I find that the work day seems to flow without my getting overly upset or stressed. I seem to move through the day without the emotional stress that is typical for me, and just keep going on to the next thing that needs to be addressed. The effect after taking EoP does not suddenly change me in any way. It seems to have an invisible, gradual effect that goes unnoticed until I look back and reflect on the day. For instance, one day I had prepared for a busy day with a demanding schedule. Late in the day I was told that all the work I had done on a specific project the night before and up to that point of the day was put on hold, that the project would be delayed indefinitely. Usually this would drive me crazy, but I was able to just laugh it off and move on without dwelling on it. Remarkable. So much of my time and energy goes into worrying and trying to control everything I am responsible for and getting frustrated with what doesn't go according to my plan. Perhaps the EoP brings in a more co-creative nature-like approach that helps alleviate all the personal junk and worry that gets in the way of letting things flow. I find that the effect is always gradual for me and just seems to happen without noticing that anything has changed until I go back and reflect to write down the results. I've been using Essence of Perelandra for twenty days. Some of the effects were obvious and immediate. And then there was the gradual quiet shift (if you can call three weeks gradual) that when I sit down and think about it, is actually quite profound. The first time I used it, I was about to go into a meeting on a subject three of us had been avoiding for months, and it was a foggy-brain afternoon. I took Essence of Perelandra orally and then shifted it [see "Directions" for steps] specifically for the meeting. There was an immediate change in my ability to focus and the meeting was surprisingly productive — we finally moved forward. I took Essence of Perelandra orally each day for my personal balance. I also used it for specific work projects and goals, volunteer activities, and health issues. The resulting effects were sometimes unusual. What would at first appear to be a lack of success in achieving expectations, suddenly turned into an unexpected opportunity and very positive experience in an area of a project that I had not given my attention to. In the past week, I have felt a calm and a quiet that is so unfamiliar. I have had many moments of fearing I was not getting done what needed to be done, that I needed to be DOING SOMETHING more. Because I shouldn't feel like this, I must be avoiding or ignoring something. Where was the battle, the noise in my brain from all that needs to be done? Where was the overwhelm? I was unusually focused on each task at hand, not doing my usual bouncing from project to project and interruption to interruption. And I was feeling guilty about it! As if I was going to be caught not doing enough. Amazingly large or daunting tasks were being completed — one by one. And small tasks I would have put off to a pile were being completed with ease. I can't fully explain it. I feel like I'm in the midst of changing a way of being that has been with me my entire life. And though I have been very aware of it for years, aware of the obstacles it creates for me, I never found a way out. I only found ways around — and worked really hard to get around my own blocks. Now, something is melting away, without any effort on my part. Out of the blue, this thought popped into my mind: "It doesn't change who I am, it takes away the struggle to be who I am." And perhaps that's what it's doing with the projects, taking away the struggle in the movement. It doesn't change the project itself. It allows it to be what it can be. I used the Essence of Perelandra for the first time last night. It was phenomenal. I could feel shifts occurring all over. My achy spine was popping and cracking, changing to something better. This morning I had a greater connection to my body and the pain in my hip was gone. I can't wait to read what it's primary uses actually are. Thank You. I've used Essence of Perelandra several times recently during regular maintenance of my piano, our boiler, and our water filtration system. In each case I asked for effective tuning/maintenance by (name of the person doing the work) on the equipment in question, and that it be good value for money. What happened was quite extraordinary. In each case, the person doing the work volunteered lots of information that helped me know how that system worked, and what elements were most important and most vulnerable. That was useful as now I can shift EoP to specific elements as well as to the overall equipment. In addition to providing the extra information they also did "extra" things that wouldn't normally be done as part of their routine maintenance. I was delighted! In the last ten days since recieving my EoP, the following delightfull things have happened: 1. When my wolf dog escaped and killed one of the dear chickens, the rest of the flock was hysterical, screaming and terrified. with the help of nature, I shifted the essence to them. There was immediate silence. They went back to their lives after briefly investigating the scene of the killing. 2. My mobile internet connection was malfunctioning when I had lots to do. I took a dose for me, then another while focusing on the device and the system it is part of. I got an immediate connection which lasted all day. 3. I have a flock of Budgies in a big flight cage. For some reason, last night they kept going into panic, banging into the wire and falling to the bottom. I tried several things, nothing worked. I kept getting up to tend to them. Then I shifted EoP to the flock and they settled right down, no more problem. 4. I have new chicks. One was very weak. I shifted EoP to her- all better! I've used 'intent' successfully over many years for making changes in my life, but adding EoP and Nature to the mix has made the process faster, more fun and well, more natural. It's like adding monosodium glutamate to life (without the health hazards)....everything turns out more flavorful! My home is more peaceful, harmonious and fun more of the time since I did the EoP shifting process for that intent. And, after 10 days with a useless broken space heater, I tried shifting EoP into the intent of having the heater operating optimally. It worked! The heater turned on immediately for the first time this year and has worked ever since! I love love LOVE the stuff! (...and I'm warm). If I had access to no other Perelandra product, this is the one I would choose. I used up almost half of the first bottle I bought, in a bath I took the night before I was to have surgery on my breast. I don't know how the surgery would have gone differently, or how I would have felt, if I had chosen not to do an Essence of Perelandra bath. I do know I was calm and focused the day of the surgery, and that healing was excellent. Since then, this has become the essence I take every night, even when I think, "I don't have time for that stuff."